One of my favourite things to do as a creative is illustrate and I really want to share this passion with you. Art is such a precious gift and personal experience and I want to give you the opportunity to have your own personalise illustration. Whether it be a pet portrait, a family drawing, or a little book to tell someone you love them, I want to create something for you that is uniquely yours and no one else’s. As such I am opening up illustration commissions on my store. I want to give you the best experience possible. Every illustration commission includes personal contact with me, the artist, with work in progress pictures delivered to you for approval as well as the opportunity for one round of tweaks and changes so you can get the perfect artwork. All current projects will be created digitally which allows flexibility in design and size so you can get the perfect finished artwork at the best size for your use. As well as a guaranteed 2 week turn around on your project, from your time of order, (this excludes murals and multi page books, which will have unique timelines, as every project is unique). Also if you decide you want a printed work I have a complementary service where I will personally help you find a print service in your country that best suits your needs, and budget. Keeping printing local saves you costs on delivery and helps grow your local business economy. Commission spots are now open, but they fill fast. Head to the store to see what is on offer and secure your spot, to make sure you get that beautiful personalised piece. If you have a unique creative project in mind which you don’t think fits the mould of what is in the store offering, you can email me directly and we can create your project together. I am always excited for a challenge, so if you have an idea you want to make a reality, head to the below form and send me your thoughts. You can also email me directly at caraord.create@gmail.com . This year is a year of new a great changes for co.create and one of the biggest which has been in the works is the opening of my very own online store now you can purchase the artwork that you love to display in your home, and while you are out and about. Every month there will be a new collection released of 5 artworks and patterns, with new stand alone products popping up in between. I am partnering with Society6 for this venture so you can access a wide range of high quality products, from a trusted and premium source. Currently available on the store is everything from art prints to phone cases, t-shirts and bags and even some furniture. As a treat to celebrate the opening of the store, anyone who buys an item and posts a photo of themselves with it on instagram with the hashtag #drawmecocreate will go into the running to win a free illustration commission valued up to $150. I am so excited to see what you come up with! This month the theme is floral portraits with a collection of 3 detailed portraits and 2 unique patterns that go together perfectly and create a beautiful addition to any aesthetic. To check out the store and what is on offer simply head here. The beauty of the internet, and collaboration. Today you can do anything online order food, get a lift, buy anything and everything and you can also communicate with anyone from anywhere in the world. We spend so much of our time on the internet we grow an identity on the platform, we live there. With the thousands of uses for this fantastic tool it surprises me why people don’t utilise more often for work and have scepticism of remote employees when everyone is so accessible. As a designer I have worked in-house, studio freelance and remote and at first it surprised me how little my work process changed. I became quickly aware that I can do my job at exactly the same standard from anywhere, and that having the freedom to be anywhere actually made my work better and gave me more resources to my disposal to make things happen. when I was working in-house or on site the only benefits I found was the socialising and being able to have a work address, other than that nothing was different. Everything that needed to be communicated for a job was always done through email or the business’ choice of online messenger. All my projects were saved to my laptop or online servers, and the production side of projects was always outsourced anyway, everything I needed was found online. When I started working remote nothing changed because everything was naturally set up for me to be anywhere because of the internet. This is why I was so surprised when people were so sceptical about hiring remote workers, what exactly was going to be the barrier. The answer to this was accountability, it is so sad that people are afraid that they are going to be taken advantage of and that there is a stigma that remote workers will “slack off” on the job. But often the case I find is that remote workers become accessible 24/7 for work because they appreciate the opportunity that comes with being location independent. Also remote work is a better solution for getting as much work as you can out of the hours you are paying for. When I work in an office I am paid from 9 to 5 regardless of how little work I have on my plate that day. In the office I am paid to sit an wait for email approvals and the twiddle my thumbs and wait for the project brief that was meant for the morning but turns up at 3pm. Working remotely my employee or client pays for none of that. I only charge for the hours I work and if I am on a retainer or contract for 40 hours a week you can guarantee that I am putting in those 40 hours with actual work, regardless of the time I do it. If a brief doesn’t rock up till 3pm I won’t start my work clock till then, I will use my day for my own needs and personal errands waiting for the *ping* sound of the brief dropping in my inbox and then I will start the clock and get to work. You don’t have to pay me for anything that isn’t the job you have hired me for. being remote also gives me opportunity to be more creative. I remember I once had a brief for a paper company to make something edged while hightlighting the paper stock. I had an idea to collage all the paper colours into a picture of lady Gaga, it turned out fantastic. But to do this I had to lug all my supplies to the office, then my co-workers kept questioning what I was doing (I was he only designer in the marketing team) they couldn’t understand why I wasn’t working on my computer. Once it was complete and scanned in, people were excited about the out come and how it utilised the product instead of being a picture of a rectangular piece of paper. The criticism and the uncertainty the office felt about my artistic process made me nervous to create something outside the box again so all my in-house work from then on in was much more tame and less creative which was a down grade from what I knew I could do. when I work remote I have all my supplies accessible to me and the freedom to hire anything I don’t have like a studi space for photography. As an illustrator and designer the space to be creative is so important and my work always excels when I have the space to think on it and do my creative process rather than trying to fit in in a 9-5 office environment. Utilise the amazing tool we have at our finger tips and make things happen. Collaborate, create and invent, the virtual world is ripe for the picking and filled with so many amazing and talented people. The new year is the perfect opportunity for you to get your brand back out there in the world. It is a time when everyone is looking for something fresh, you might be the thing they were missing out on last year. Especially if you are working in the self care or self improvement service and products sector the start of a new year is vital for you to make your impact. Do not let yourself and your business get lost in the clutter of the new year rush, take this chance to re-invigorate your business, start trends and get yourself out there in the spotlight. The first few months of the year are dedicated to re-invention and self improvement take this chance to look at your brand, figure out what works and what doesn’t and tweak your look and feel to let your business shine. If you are feeling like it may be time for a refresh but don’t know where you start, don’t be afraid to call in a professional. I would be more than happy to run you through the potential of your business and work with you to work out a brand plan and develop a new you fit for 2019. If you are more of the independent sort or want to get a running start on leveling up your brand below are some quick do’s and dont’s for this coming refresh season. 1. Although it is tempting, leave what was cool in the past in 2018. Don’t really on previous hypes and trends to boost your business, this is your opportunity to get creative and create new trends. The new year has everyone looking for new, so r own trends for 2019. 2. One of the biggest audiences you will have looking out for the next big thing will be millenials, we are a forever restless generation and we like to be ahead of the crowd, so if you have a product or service that applies to this generation, push your campaigning in that direction. 3. Sometimes less is more. Carefully evaluate your current audience and your ideal customer and see what your current brand is doing to align with them. Maybe you are already on the right track and just need a little fluff up to have a solid start to the year. 4. If you are really happy with how things are going, don’t mess with the status quo. However always keep your brand and audience in mind, if you become comfortable to the point of lazy your top notch brand could age and this could impact your business. 5. Finally, stay recognisable. If you already have your business up and running I wouldn’t recommend a 180 flip of your brand. Remember to keep at least 20% of your brand essence so your current customers can still find you and relate to you. I hope that some of this advice helps you and that your start of 2019 with a bang. If you would like a brand consult simply use the below form to get in touch or email me at caraord.create@gmail.com and we can work together to make your business next level. There seems to be an ever growing myth that design is easy, with more and more digital programmes and apps now available on the market more and more people are taking it into their own hands to “whip up” designs for their brand, business and community. But before you jump down this rabbit hole I want you to stop and think about the potential damage you could be doing to your brand, and how a damaged brand could impact your lively hood. It is true, anyone can design, with the proper tools and training, but that doesn’t necessarily mean that they will be good at it. Design is not just combining images, colour, typography and text into a visual product, design is problem solving, it is about more than just aesthetic. It is due to this that I implore you to consult a professional when endeavouring on creating assets for your business or developing your brand. A designers biggest tool to get hired is their portfolio. It is your first impression and can make or break your chance of getting a job. The difference between a good and bad portfolio can be subtle and I want to help you make yourself as hireable as you can. Every creative has unique skills, and a talent which is gold for the right career. I want to help you highlight your assets and market yourself to get your dream job in your industry. I have been a designer for several years and have worked with a huge range of clients, from brides to big corporate business, I have dipped my two into projects of all sizes. Some projects went amazingly well, the client was happy, I’m happy, it’s on deadline with no problems. Then there were others which were to say the least... problematic. I really do care about my clients and the work that I do. I don’t want anyone to have a bad experience, but sometimes things get out of my control, frustrations come along and the project begins to suffer because of it. I have learnt a lot about client relations and project management and can pretty much deal with anything that comes my way. So I thought I would help you out with some simple tips to make sure your projects run like clockwork and keep your designer happy so they produce the best work they can for you. I am a professional designer, illustrator and artist and the one thing I can tell you about a career in the creative field is that you never stop learning. Whether you have to fast track your learning of new programs and trend styles constantly updating in your field or learning entirely new skills all together, it is a never ending process of self education which takes a deep commitment and consistency to make sure you always stay at the top of your game. The best tool I have found to help me along the way in my career is my sketchbook. It is a dedicated personal space designed for growth, emerged in the visual culture which my career and way of thinking revolves around. So as I said in a previous post. My love of books runs deep and I hope to publish a children’s book before I am thirty (or even twenty five… but let’s be realistic). My first step into the world of children’s publishing happened at university doing a class assignment to, well, illustrate a children’s book. For this task I chose the below poem, an old famous Australian piece from 1889 by Banjo Patterson. Words are beautiful and complex things. A random collection of letters conveying unique meanings with each reassembly. I love the art of writing and reading the work of those which are so much more eloquent than I am. I may not be a beautiful wordsmith but I do love the art of letters and the visual appeal of good typography and calligraphy. As a designer I work in typography, arranging texts and creating appealing and readable products for clients. From brochures, business cards and ebooks to websites and magazines. Typography is such a vital part of all design and should be carefully considered and taken care of. I take the readability and presentation of text as one of the most important aspects of all design and work with my clients to highlight their most important message and add to the quality of their words. As you can see good typography is important to me and also a valuable part of design. However I also enjoy working with individual letters and combining my loves of graphic design and illustration. In one of my most recent projects and challenges I worked with the english alphabet, combining it with ink illustrations of succulents to form modern print designs over 26 days. This project was in conjunction with the 36 days of type challenge which is held annually over instagram and is a beautiful opportunity to see the works of many dazzling artists and designers and play with the english alphabet. I have participated twice in this event and will continue to do so as I highly value the written language and what you can create from it. Below you will see a collection of various letters I illustrated for this years collection. Each corresponding to a succulent plant named with the corresponding letter. To see the collection in full, head to my instagram. Over my time as a designer I have created several illustrative alphabets and individual letters. I love creating these works as prints and unique pieces for clients. A beautifully illustrated letter could be a great house warming gift or baby name plate. If you are interested in any of the work I do or commissioning your own individual letter please contact me through the form below. I am more than happy to be of service and create something special for you. Often when you run a business it is your baby. It is personal. Anything that happens to your business directly impacts you and so you feel like it is part of you, an integral part. Being a small business owner myself I understand this feeling, but don't get trapped. Yes; your business, how it runs and whether it thrives effects your livelihood and income. However it is not you. A bad review of your business should not feel like a personal stab. In reverse a personal crisis should not impact your business (with the exception of emergency changes in open hours). Running your own business. Make sure you keep a clear definition of what is personal and what is professional. Self employed and entrepreneurs are abundant and passionate but often fall into the trap of being too emotionally invested. This often leading to the detriment of them and/or their work. Although it is definitely not all that is needed a good rule for success is not getting too attached. A business is a job and should be run efficiently and diligently. Being too emotional in it's workings can lead to poor decisions and the slow inevitable road to ruin. Do not consider your work as a part of you or as a friend or baby, it is a business partnership (literally). No matter what your business is, whether it is an Etsy shop for craft ware, a personal training company or a parts supplier, the same rule applies. Logic wins over sentiment. Now to clarify I am not talking about changing your brand. If you brand is all about being close and personal with your clients and being 'like' a family figure then that is great, but your brand is the face of your business and shouldn't be your personal persona 24/7. I am talking about cutting emotional ties with your work. It is not only poor work practice but negative for your health. Being too emotionally invested in your work and business can cause major stress and can be a trigger for anxiety and depression. You cannot keep all your eggs in one basket. A business is there for financial support and as an expression of passion, you cannot also use it as an emotional crutch or replacement for a life and relationships. Lead a balanced life. For your business to prosper it cannot be everything to you. For it to work it needs to have the opportunity of failure without ruining your life. I am a work-a-holic, I know what I am talking about. I have been career minded since high school and I used to get my sense of pride and worth from work. I would for go relationships and friendships because I didn't think I needed it and the only way I felt successful is if I was over worked because then I knew I had given my all. This is such an unhealthy way to live. Although i didn't know that at the time. So how did I get myself to flick the switch and get out of this unhealthy situation before it was too late? Well I didn't. I was stressed, overworked, started pulling all nighters and became a sufferer of anxiety and depression. It sucked. Only once I hit my low did I realise what I was doing wrong. By this point I did have a relationship (with my now husband) and he was the blessing which helped me most on getting back on track. But here are a few tips for helping you seperate your emotional dependance from your work or business before it becomes too late, tips to help you lead a healthy balanced life while being the super human you are making your business work. Have someone to make you accountable - now family is great for this but they can be too close. I recommend having a great group of out of work friends to go to where you can let out some steam and get advice as well as let down your hair with. Now introverts like me may be balking at the idea of socialising, I understand the pain. However it isn't hard. If you don't have one or a couple friends out of work, join a club or do classes for something you love. In a structured environment it is ten times easier to hit it off with someone and that way you will have dedicated time once a week to be social and catch up. Exercise daily - Now before I start sounding like a life guru or a personal trainer (which I am not) I am talking about light exercise. The kind which simply gets you out of your chair, your office, your shop and gets you moving. I take walks every morning before I get down to business and it helps to calm my mind, and most importantly seperate my ‘me time’ from my ‘work time’ giving me a healthy transition task to do before I get into my email inbox. Do not be your brand - I sort of touched on this earlier. But it is so important that you are not the brand of your business. I talk about Brand in my free ebook which you can grab here. You and your business are both individual personalities. Your brand/business does not have opinions like you do, no political/religious sway, it does not favour the food you do, do it's hair like your or like the same music. Your brand does not hit snooze, or read the books you do or go shopping. Your brand is not you so don't make yourself your brand. Your brand is the face of your business, you're its spokesperson, make sure that you make a definitive separation between the two (especially if you have employees). If you need help with your brand and making it work for you let me know, we can chat using the form below. Schedule - it is so, so easy to make your business a 24/7 thing. Having your email right there on your phone and everything literally a hands stretch away can make it so easy for you to work work work. This is why it is so important to schedule your time. Running your own business gives you freedom to live how you want to, it is not a license to work all the time. Schedule out when you want to work and your me time. This could be setting a simple 9-5 schedule for yourself or be more complex and having 4 hours of work split throughout the day, 7 days a week. Whatever you decide make a work schedule and stick to it so you have the opportunity to let yourself switch off. Make sure you have a hobby which isn't work - I am the type of person which seems to turn all of her hobbies and passions into careers; design, illustration even iceskating have all become jobs for me. My advice is to have one hobby that will never be a job. At the moment for me this is reading, and in the future when I work with books (as an illustrator/designer) it will be knitting (I am so bad at it I know I can never make a career out of this hobby). Have something you can do that you can relax with and you don't have to do as part of work. I hope my little bit of advice can help you relax. Please seperate yourself and your business. Your business cannot be everything for you, it is an impossible task, and you can't be everything for your business. Have fun and enjoy life. That is why you started this venture in the first place isn't it? many people I come by, when they first find out I am a designer think I mean interior design. When I mention that I mean graphic design they quickly get confused or lose interest. People either think I doodle for a living or make websites. Graphic design is so much bigger than that. so… what is graphic design? Graphic design in short is visual problem solving. It goes over a wide range of medium from print to digital and umbrellas a large range of skillsets. When someone says they are a graphic designer they are giving you a broad and easy context into what they actual do. A designer can be a coder, book designer, typographer, content creator, social media specialist, interactive designer, video editor, the list goes on. I am proud to say I am a graphic designer and I do multiple of the listed trades (to know more on that check out the services listed blogs). This is an example of graphic design. A very simple piece created for social media. The problem solved here is creatively ask a question to attract a response. I label myself as a designer and illustrator and again this confuses people. Can’t all designers draw? The answer is actually no. You don’t have to be able to draw to design, you just need a good aesthetic mind and visual language. Illustration is a completely seperate skill set. Many designers can be illustrators but they are not one in the same thing. Illustration is the use of drawing and artistic techniques to tell a story through imagery. 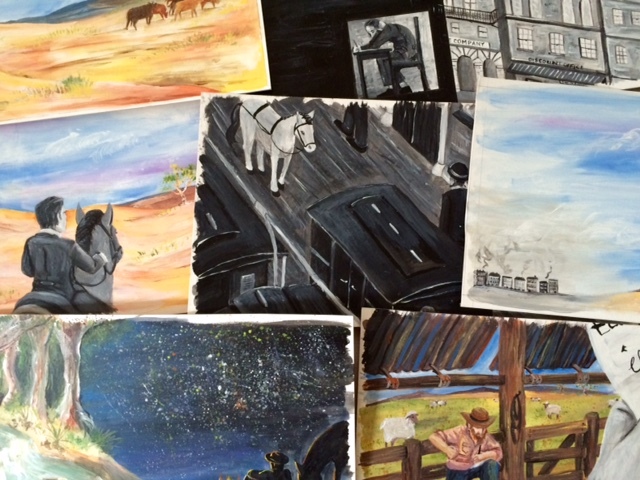 My personal preferred mediums are watercolour, acrylic, pencil and digital illustration. It is such a diverse field there are literally hundreds of ways to illustrate and I love exploring the captivating beauty of each individual artists take on the world. I follow many illustrators and I am lucky enough to have interviewed some great talents, you can see these in the inspiring illustrators tab beside. A quick illustration depicting sea creatures I found at the aquarium. I hope that this short blog helped you learn what graphic design is and distinguish between design and illustration. It is important you find the right person for the job (as not all people can do both). Design is using visual aesthetic to problem solve and illustration is using drawing and pictures to tell a story. If you have problem that requires a multi-disciplinary solution of illustration and design try seeking out a multi-disciplinary designer like myself or contacting an agency to match you with the talents you need. I hope you have a good week and I will see you in the next blog. It is so important to not be a taker but to be a giver. A business which just takes will eventually die out because you are not nurturing your audience. Think of a rainforest ecosystem, if the large trees just sucked up all the nutrients but didn't shed their leaves to mulch the earth the will eventually take all the good things out of the ground and die out themselves, strangling the young plants around them. SO giving is really important. The question is, how to grow your business? How do you give? You already sell great products and services, what more do you need to do? Well giving free advice and sending out free resources is actually a fantastic way to nature your audience. It helps you to build a community. Even if you are a 'teeny tiny' business like mine there is always something you can give. That is why I try and do a weekly blog, to share my insights and professional knowledge to help you. Recently I have been thinking about small business, and what I can do to help out those of you who are independent creators and business owners. The first thing I thought was I want to support you and give you something that will help you promote and grow your business, expand your clientele and hopefully improve your revenue. That is when I decided to make my free resource 'A Guide to branding for small business'. It is a simple short eBook that you can use to help you get on your way in branding your business. The eBook explains what branding is and how it can help you market what you are offering. It even includes 5 tips to start branding your business, or improving the branding of your business yourself. But then I thought, I can do more. Sure I just made this great resource (which you can find here) but I can help you one step further. Through this class I will take you step by step through the creation of a simple and effective eBook. I also add an abundance of tips on branding, content writing, social media promotion, creating visuals for your business and more. I am so excited to share this with you as it is brand new and I hope really helpful for you in your business journey. If you would like to check out the class head here. I hope both these resources are helpful to you and help you grow your business. if you have any questions feel free to contact me. I am here to help you out. Have a great week and I will check in with you next week. Graphic design isn't just for corporate clients, we don't just make logos and advertisements, there is so much more. When you think of graphic designer often what comes to mind is a corporate hipster drinking overly priced coffee and pretentiously gloating about branding and UX and their next high-class client. However not all of us, or many of us designers actual fit that bill. Yes I may like a nice Starbucks once in a blue moon and yes I do branding for my share of corporate clients but that is not all I am about. My biggest group of clientele are actual ordinary people, brides with upcoming weddings and mothers who want a special design for their baby dedication. These clients don't want a flashy logo or branding that grows their reach or attracts profits. They have nothing to sell, they simply want something beautiful and meaningful for them. As such you should not treat these lovely people as if they are a business. When doing what is considered standard graphic design we are doing 'problem solving', finding the best visual and experience solutions to answer a clients problem. However designing for sentimentality is more than this. You are not solving a problem but seeking to bring happiness, and this means that you should take care in every step of the process. Treat your client as a friend, or family. Respect their wishes and tastes, this project is purely for them and them alone. Unlike other design projects you only have 1 person who has to be happy at the end of the day and that is the client standing right in front of you. I offer wedding invite and stationary design and personalised illustration for weddings and families as part of my eclectic services. I love being able to find that perfect design to put a smile on a Brides face. A bride just wants to know that you get it. That you understand what she wants. Wedding planning is stressful and any tension you can take away from that is a blessing. When designing or illustrating for sentimentality the biggest thing you can do is listen. Listen to what your client wants and do your best to provide it. On top of this go the extra mile, have a conversation with your client, you may be able to help them out in more ways then just design. Maybe you can direct them to a great photographer or recommend colours for a beautiful bouquet. Trust me, your client would love that you have gone the extra mile and respect you for it. Being attentive to your clients adds value to your service, a value which sadly is not widely available. Designing for personal projects remember to treat each client as an individual. Never box them in or categories them. When working with a personal project, where the clients heart and soul is in it a template will never do. Respect their passion and their time and effort put into this project. They haven't come to you to be cast aside or handed off, they have come to you for your expertise and advice. They just need your help crossing the last hurdle to their happy finish line. If you are a possible client reading this. Please do not allow yourself to be under valued. Yes hunting for the cheapest price may get you a quick design but I can guarantee the designer on the other side is just wanting to do a quick slap up job to gain some quick cash. When hunting for someone to make your wedding invites, or a poster or mural for your home, don't settle for someone who doesn't treat you like you are your own person. When clients quote through me, I strive to make sure that I have added value to their lives. Sometimes the budget may not fit the project but we work together to create something out of it. Whether it be by creating the dream piece they wanted, giving them helpful tips and advice to help them with their plans or by educating them about the design world and what steps they will need to take to complete their project. I hope this little piece has helped both designers and clients and that both parties earn the respect they deserve. If anyone may need my assistance in a sentimental design project, whether it be a personal endeavour, party/event invites or wedding stationary please contact me through the form below and I would be happy to lend a helping hand, or share any advice I can offer. Following on from last weeks animal conservation theme we have the gorgeous work of nature illustrator Michael DiGiorgio. Michaels work depicts birds in all their beauty straight from our world. He searches for his subject matter and paints them in place using their real appearance, habits and movements to get a in depth idea of his subject matter. Hello Michael, Thank you so much for offering to share some of your wisdom with us today. Your work has such fine detail and really demonstrates the beauty of the natural environment around us. You capture all your nature imagery from life. How did you learn to observe such detail in a moving subject? What drew you to birds as your main subject matter? Don’t know? I was born with a fascination of birds, and it’s carried over throughout my life. I guess the combination of color, song, and flight is the main attraction for me. Everything I do in life eventually comes back to my love of birds. Can you talk us through your field kit? What is your preferred tools of choice when creating your illustrations? I have a small half pan watercolor kit, a small water container, a soda bottle with water, a stool, and an Arches watercolor pad. Most of the time when I’m sketching in pencil, just a small sketchbook and a pencil. When I’m stationary and painting, I use my angled spotting scope. How long does it take you to produce a piece such as your ‘Scarlet Macaws’? Observation and sketches is the first and most important step. Second is photos I take of backgrounds and habitat. Last is the accuracy of the drawing, noting else matters if the drawing is off. Next choosing a style that reflects the subject, and then getting a light source to work with. I use skin I get from Yale Peabody for plumage and photos for the rest of the reference. Working from life how do you decide what details to keep and which to omit, such as background busy elements or textures? There are two type of marks you can make on a piece of art: one adds to it and one takes away from it. It is harder to leave the unnecessary out than it is to put the unnecessary in. It takes many years of doing this to know when to stop and how much to put in to bring your subject to life. Unnecessary detail communicates a lack of knowledge of the subject to me. Do you go out hunting for a specific subject or do your subjects find you? talk us through the process of your illustrations from idea to finished piece? When I go out, I’m usually on the hunt for a specific subject. Sometimes on my way I find an unintended subject that is more interesting, and I paint it. But most of the time, I’m after a specific habitat and bird that speaks to me at the moment. If I can’t finish it in the field, I usually bring it home and then try to capture the experience in my studio and finish it. It’s often so much harder to get that feeling of immediacy of the direct observation and the freshness in the studio. It just sort of flows out of you when you’re in front of the original subject. Have you had formal training in your craft? if so can you tell us a bit about your experiences? Yes, I have a Bachelors of Fine Art and a Graduate Degree in Art. But most of my education came from Don Eckelberry and going out and learning on my own. He taught me how to place the bird in a convincing pose with enough background to suggest it’s habitat, but not too much as to take away from the subject. does working professionally in illustration diminish some of your passion for the work you do? No, it augments it. Having to work with world class ornithologist like Bob Ridgely, and working with world class artist like Guy Tudor has only made me better as a bird painter. But there is a huge difference between painting an illustration, and painting my own pieces. An illustration is solely for the audience, and their ability to compare my painting to the real bird. When I work on my own paintings, I’m recalling a personal experience with a bird, and I’m only trying to please myself. How does your cultural background and environment impact your work? I guess growing up in a somewhat poor Italian American family, I learned how to keep myself occupied by seeking out solitude in nearby wood lots, etc. My tight family life only encouraged my talent, and I fed off that. Being a nature illustrator often featuring your pieces is nature journals and books how does your professional life work? Are you commissioned to capture specific specimens and then paid to travel in search or do you create your works and then auction them to publishers? It takes many years to establish yourself as a capable bird painter. Only by honing your craft and proving that you can interpret your subjects in a convincing way and follow through a project in a timely way do you start getting noticed. It took me many, many years of doing small jobs, free work for nature organizations, and contacting publishers to get a major job as a field guide artist. The initial contact is not from a publisher, but from the team creating the book; editor and the main artist. He is the one usually responsible for contacting other artists for the project. Meeting Guy Tudor and Bob Ridgely was my biggest break, and that only came about after seeking such work, and being suggested as a capable artist. Once you get the job, you are usually assigned a group of birds group the editor, and then you work with them to make sure each bird is exactly correct. Probably my recent work on the Birds of Brazil by Wildlife Conservation Society. I think they are some of the best bird plates I’ve ever done, thanks to the direction of Guy Tudor. When you began as an illustrator how did you get your voice heard among the crowd? Just ignoring everything and trying to become the best you can be. Being a professional bird painter is a profession next to impossible to make a living, so the ones who succeed are those who don’t give up and do it because they can’t help but to do it. Just find your own voice and learn to become your harshest critic. Once you learn to please yourself, then your ready to have your work out into the publishing world. Traveling and painting nocturnal birds like nightjars. They are among my favorite family of birds, and I’d love to travel to Africa and see them in the flesh. After that it’s to have the time to paint my own work. I never seem to be able to break away from my illustration work long enough to do my own paintings.